There isn’t much that is better than taco night at home…. unless you also make your own tortillas! I discovered how ridiculously easy these are to make when I had a midnight taco craving and lacked the get-up-and-go to make a TB run (and that means a lot… I do love a cheesy gordita crunch!). Success! Pull out the ol’ cast iron skillet again, because these homemade tortillas will have you eating tacos every night. All you need for this fiesta is a few ingredients that you will certainly already have in the kitchen and a stiff margarita. I’ve made a batch of these and kept them for a couple days without any issue. Next stop, quesadilla land! If you’ve ready any of my old posts, you’ll know that I am a sucker for a good ol’ Southern cast iron skillet. They keep their heat, cook evenly, are indestructible and are the key to a good homemade tortilla. You want a high heat pan that will evenly cook the tortillas in a matter of seconds. 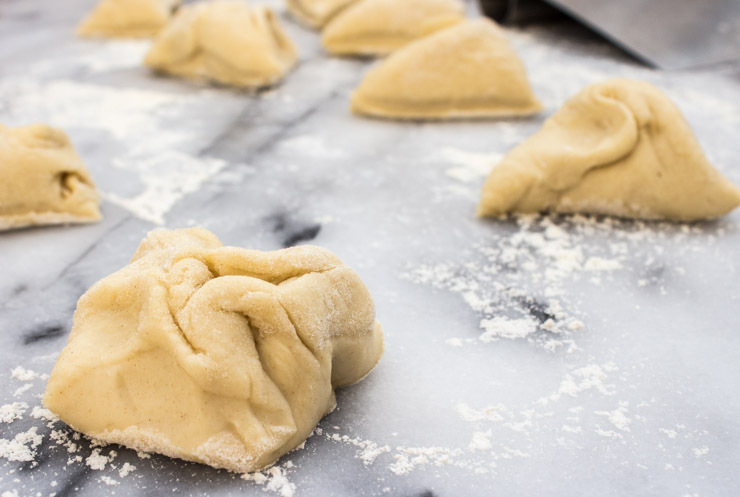 Combine all dry ingredients with the butter into mixer with dough hook. Add water and mix until smooth dough forms, about 2 minutes. Remove and divide into 10-12 portions. Roll out into circles on lightly floured board with floured rolling pin. Aim for dime thickness. Heat dry skillet over medium/slightly above medium heat. Cook dough circles in dry pan until golden bubbles form. Flip and cook slightly to color other side. 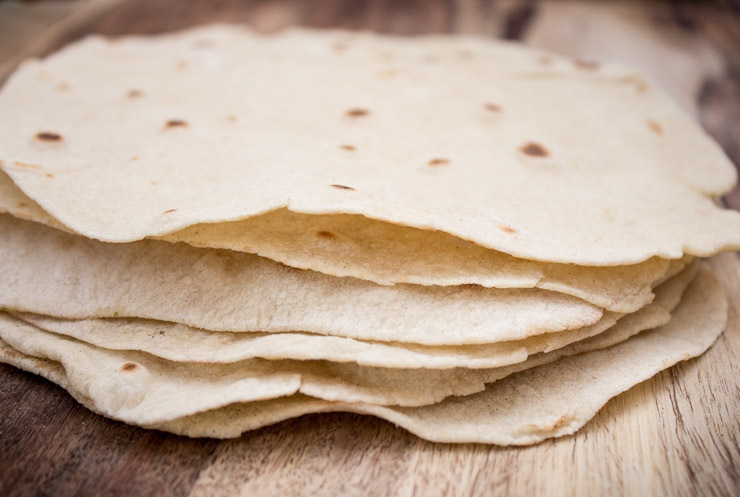 Stack with paper towels between to prevent soggy tortillas. 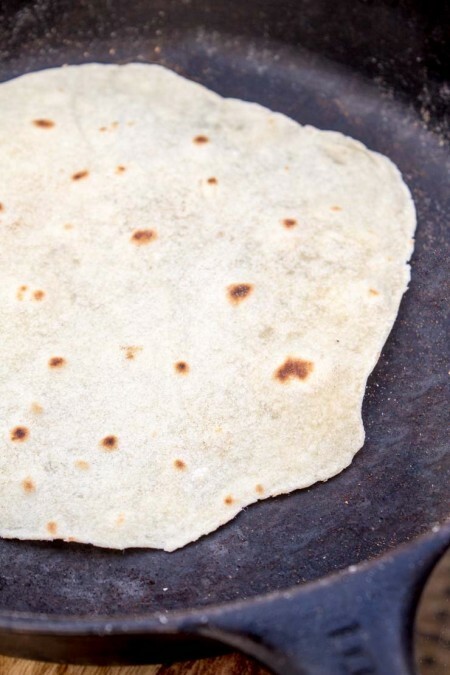 What’s your favorite tortilla inclusive recipe or meal? Let us know below! Previous Post: « Happy 4th, Y’all! What could I use instead of a dough hook? Plenty of counter-kneading will work just fine. Ha! I finally did it!! I finally made perfect tortillas! Thanks so much for this simple recipe.I think I can actually commit this to memory. Yessss! I love this recipe for exactly that reason. So simple! Glad you enjoyed them. Thanks so much! I only added salt because I was in a rush cooking. I look forward to adding spices next time. Sorry to hear that. — I’ve rarely had any trouble with these. Not sure what I can do to help you troubleshoot, except suggest making sure that your dough is very well combined before moving forward. The recipe does not call for any oil at all, and they should be cooked on a dry pan (see Step 6). You shouldn’t have much flour at all remaining on the tortillas when you go to cook them. I had no idea tortillas could be made so quickly! I’ve been wanting to make whole wheat tortillas for a long time (because I can’t find good tasting/quality whole wheat tortillas anywhere) but had given up because I thought it was a long process. I made some tonight using ww pastry flour and they are amazing! A couple hours in the fridge and they are still soft, too. Thanks so much for sharing…I am so excited about this and will be making them frequently! Love it! They’re super simple, aren’t they? It’s my go to for quick dinners. I thought there was more to making tortillas. I had no clue they were so easy. Thanks for sharing! Right?! Pretty simple this way. Had no idea tortillas were so easy to make! Where have I been? Can’t wait to give these a try!